"What's right isn't always popular. What's popular isn't always right." Wise words from one of our first catalogues, published over 20 years ago. It's wisdom that continues to inspire us today, and it's why we do things a little differently around here. No trash cans at our desks, for example. We like a little yoga with lunch. We speak our minds. We help our neighbors. In short, we practice what we preach. That's why we encourage our employees to take time off to go do something good for the world. 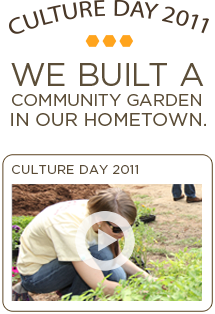 It's why, each year, we hold a Culture Day to promote community outreach—in the past we've planted urban gardens and built hive boxes for the recovering bee population. We encourage wellness through weekly onsite yoga. And through the Greater Good Team, we strive to maintain environmentally friendly practices within our company and alongside our partners. We're basically a bunch of hands-on, tree-hugging, greased elbow do-gooders. It's kind of what makes our company special. We think the bees would agree.